Magnetic reconnection is a phenomenon of fundamental importance in space and laboratory plasmas. So far, the three dimensional magnetic structure of a magnetic null - the core region of this physical process - was never observed in situ, as it requires at least 4 simultaneous points of measurements to characterize it. For the first time, four spacecraft flying in formation, the Cluster mission, have directly observed it in the Earth's magnetotail. Published in the July edition of Nature Physics, an international team led by Chinese scientists not only report this observational first, they also reveal fundamental topological and physical properties of such a null, including its spatial extent. This scientific breakthrough is a truly experimental "tour de force". Image 1. Artistic view of the four Cluster spacecraft encompassing a magnetic null region. 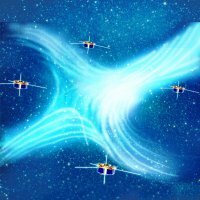 Magnetic reconnection is a key physical process in space and laboratory plasmas and its macroscopic consequences are numerous. To name a few, it is the physical process responsible for solar flares, tremendous solar explosion sometimes billion times more powerful than an atomic bomb. It is also considered to be the most efficient mechanism for solar material to penetrate the Earth's magnetic shield, a potential hazard to astronauts and satellites. In the Earth's magnetotail, consequences of magnetic reconnection include significant energetic particle injection at geosynchronous orbit and increased auroral activity. On Earth, it is a mechanism preventing magnetic confinement of the fusion fuel, thus a key issue to produce electricity via controlled fusion reactors. Magnetic reconnection is the process whereby magnetic field lines from different magnetic domains collide and reconnect, changing the overall magnetic field topology [Animation 1]. This topological change leads to the mixing of previously separated plasmas. It also efficiently converts magnetic field energy to particle energy, generating reconnection jets (along the horizontal white arrows on animation 1) and plasma heating. However, certain fundamental properties of this phenomenon remain unknown. One key issue is to understand what happens at the heart of this physical process, around the point where the magnetic field lines break and reform, known as a magnetic null point. Attempts have been made in the past to document a magnetic null region based on its traversal by a single spacecraft [Scudder et al., 2002]. 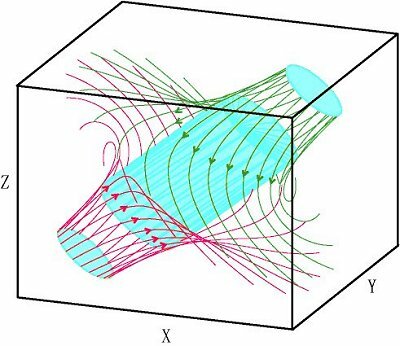 However, the 3D magnetic structure of a magnetic null can only be described through measurements obtained simultaneously from at least four points in space [Image 1]. Image 2. 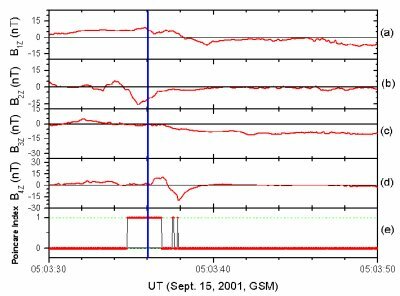 The high-resolution (0.04 seconds) magnetic field data of the four Cluster spacecraft and the calculated Poincaré index during 05:03:30-05:03:50 UT on 15 September 2001. (a-d): The z component of magnetic field data of C1-C4. (e): The Poincaré index is calculated from intercalibrated high resolution data. A magnetic null is characterised by a Poincaré index equal to 1, such as around 05:03:36 UT (vertical blue line). Outside this time period, the Poincaré index is found to be less than 10-6. On 15 September 2001, the four spacecraft of the Cluster mission were flying in formation in the geomagnetotail when they encompassed such a magnetic null. An international team of scientists indeed report, in this month's edition of Nature Physics, the first in-situ evidence of a 3D magnetic structure of a magnetic null based on these measurements, using a mathematical method called the Poincaré index [Image 2]. Thanks to a thorough analysis of high time resolution magnetic field data (0.04 seconds), the first description of important topological and physical properties of such a null are revealed. Image 3. Spiral structure of the magnetic field around the magnetic null. "The results indicate that the null has a positive-spiral [Image 3] whose spatial extent is of the same order as the local ion inertial length scale (~500 km in this case). This characteristic size has never been reported before in observations, theory or simulations", wrote Professor Pu from Peking University, Dr. Xiao from the Chinese Academy of Sciences in Beijing and Professor Wang from Dalian University of Technology, Dalian, all members of the China Double Star-Cluster science team. These results have been obtained in collaboration with European and American colleagues. "For the first time, the heart of the magnetic reconnection process is revealed in 3D. The properties derived are fundamental to understand the dynamics of 3D reconnection around magnetic nulls. This result is a major achievement of the Cluster mission", said Philippe Escoubet, Cluster and Double Star project scientist of the European Space Agency. Arnaud Masson, SCI-SO division, RSSD, ESA, The Netherlands. Philippe Escoubet, SCI-SM division, RSSD, ESA, The Netherlands.